On Tuesday, September 17, 2013, Parental Rights Advocate, Leon Koziol was selected to provide testimony amongst hundreds of people who had gathered at Pace University in Manhattan to participate in the first round of the Moreland Commission hearings on the subject of public corruption. Mr. Koziol’s presentation was well received by both the audience and the commission. Outside the event, there were widespread demonstrations and public protests taking place resulting in a number of arrests. Good evening. My name is Leon Koziol, and I serve as Director of the Parenting Rights Institute, a private consortium committed to systemic reforms in our nation’s domestic relations courts. I am a former school board attorney, chief counsel for an upstate city, and two term councilman. Over a period of 23 years, I secured large recoveries for victims of government abuse and final judgment declaring the largest casino operation in New York unconstitutional. War veterans and public safety officers like the responders at 9-11 are coming home to a court system which continues to feature institutional discrimination against fathers. It is nice to know that our governor has given women 75% of the executive composition on this Commission, but men remain 85% of the child support population according to Census reports. It is problem of epic proportion, and we see the consequences every day in our schools, streets and homes. The files we have generated cannot be summarized here, but I will provide you with pertinent news stories and a series of complaints filed with the state’s Commission on Judicial Conduct. All of them over a period of years have failed to reach the investigation threshold, leading the common citizen to logically conclude that such commissions are mere window dressing which does more to facilitate misconduct than it does to rectify it. It is one thing to ignore public corruption, but quite another to target and punish the whistle blower in violation of the federal and state constitutions. How can a self governing people become properly informed through qualified attorneys to maintain accountability over their third branch of operations? To bring this all down to earth, how can we stop the first minority commissioner in Utica, New York, a/k/a “sin city” and “mob files,” from attempting suicide in the city lock-up after years of successful litigation because I could no longer represent him? Today is Constitution Day, and I would hope that our rights do not incur further erosion through suppression, inaction, fear or ignorance in the wake of Edward Snowden, the IRS scandals and the Trayvon Martin case. If the public cannot secure rational justice in our courts, where can this Commission go with its findings? Violence and disobedience are the natural by-products. It is our duty under that same Constitution to demand accountability. This may require a lecture about democracy and equality from the president, but Vladimir Putin is not one of your speakers. An alarming report was sent to Loretta Lynch, a confirmed presenter, and I discussed my ordeal with her deputy attorney. I have yet to receive a return call six months later. A secretary was planted in my office to orchestrate ethics violations as part of this retribution process. She was finally arrested in a rural county with our assistance for passing herself off as a licensed attorney over a period of years. She remains at large for multiple felonies committed across state lines. If a reckless secretary can succeed as a professional imposter for so long, how will we know that Homeland Security can track down highly skilled terrorists? More to the point, how can I report criminals without subjecting myself to further retributions from my own government? I authored two books about terrorism with help from a minority public safety commissioner, police chief and military colonel. I can assure this Commission that we remain at serious risk. First, I am asking for a review of domestic relations laws for their combined injury to parental privacy. The goal here should be to get our courts out of the “child business” as one family judge put it. Jurisdiction should be limited under the Constitution to child abandonment, abuse or public charge. Custody awards and welfare transfers inflame needless controversy and are not in our children’s long term interests when similarly involved parents are self sufficient. Second, the state’s Commission on Judicial Conduct should be investigated and decommissioned much like the former Commission on Investigations. It is an entity which is politically impacted and ill equipped to properly address judicial misconduct. Only one judge above trial level has ever been publicly admonished, many are town or village judges without law degrees, and the state’s former chief judge, Sol Wachtler, like so many higher level criminals, had to be apprehended, prosecuted and sent to prison by federal authorities. Third, I am asking this Commission to investigate our current chief judge, four appellate division judges in the Third Department and one in the Fourth Department for their unlawful targeting of my civil rights activity. In a highly unprecedented move, an entire appeals court disqualified itself from my professional and family matters after I filed a complaint in federal court. On May 24, 2013, ethics lawyers engaged in the witch hunt against me conceded in open court that they were targeting my public statements. Weeks later, they were terminated for falsifying time sheets, apprehended not by a self regulating court but by the Inspector General. Compelling precedent behind my requests can be found in the case of ex-chief judge Sol Wachtler. He directed publicly paid court staff to investigate a New Jersey lawyer to impair his licensing interests in New York because he represented a threat to the judge’s criminal activity. Given the limited time allotted to me here as a speaker, I am offering print material for your deliberations. The notion that judges are immune from accountability is answered here by a sampling of misconduct cases which should have every parent and family in America concerned. From the top down, judicial misconduct reads like a docket sheet in any criminal court. Examples include New York Supreme Court Judge Gerald Garson, convicted of bribery and official misconduct in 2007. He was caught on camera accepting a $9,000 bribe from a divorce lawyer in chambers to fix a custody case. Had the mother not sought assistance from the FBI, she would have lost her children for a payment much less than most contested divorce retainers. The judge served minimum time in prison due, in part, to the many references from his colleagues. Supreme Court Judge Thomas Spargo was convicted for soliciting $10,000 from a lawyer facing a personal divorce in exchange for favorable treatment. The money was required for growing legal fees to defend against ethics charges. Much of the misconduct in my case involved judges with offices in a Syracuse courthouse. The chief administrative judge there was among the defendants named in a civil rights action brought by the chief court clerk alleging political espionage against a competing judge of the Family Court. It resulted in a $600,000 recovery. was opposed by the divorce and child attorney on grounds that he was beyond reproach. It was fortunately granted prior to the standard child session in chambers without the parents present. Only last month, a Michigan judge was exposed for presiding over a child support case in which the mother was his secret lover. He admitted a practice of allowing the female litigant privileged access to his chambers for the purpose of engaging in “special” relations. It caused an unplanned pregnancy and major back peddling to explain impartiality. The list goes on: a Pennsylvania judge convicted for imprisoning 4,000 children in newly built facilities in exchange for contractor kickbacks, and a Texas family judge exposed on his daughter’s video for child abuse. This is only a sampling of judges actually caught for their misconduct. Many more would be exposed if judges honored related code obligations which mandate accountability for unethical conduct. In my case, they simply passed the damage on to successor proceedings as a mode of retribution, thereby causing serious injuries, costly appeals and vacated orders. There have been 30 trial level judges and more than 50 decisions requiring an appeal. How is this even possible? How does it comport with minimal requirements of due process and an orderly system of justice? On the lawyer end, collusion between the bench and bar is implicated in civil rights cases brought by New York City ethics counsel, Christine Anderson and Nicole Corrado. They paint a very disturbing picture of insider protection for lawyers committing serious misconduct and discipline for targeted lawyers outside the system. In my case, the targeting process carried over to my children in Family Court and the same appeals court where my law license was impaired. The misconduct here is extensive, but suffice it to state, an agenda was put in place to orchestrate child support violations for incarceration purposes. To do this, various judges fabricated degrees and accomplishments behind imputed income so that support orders could be artificially elevated to unmanageable levels. One judge awarded me a PhD in the text of his formal decision. I filed a complaint regarding gross incompetence. It concluded with deference to the appeals process. When I filed my appeal, a higher judge agreed that I possessed no PhD, but he whitewashed the incompetence as a mere “passing” and “harmless” error. The appeals judge then awarded me a Masters degree in his formal decision. I have no such degree, my ex-spouse possessed that one. Indeed the litigation process has become so retaliatory, so demented and so torturous to my children, career and income producing capacity that I was forced to ask our state courts for no more degrees, no more concocted employments and no more phantom awards. I leave you with a true story about a former client upstate which demonstrates the enormity of work entrusted to you by the people. He was arrested on multiple criminal charges within days of his dismissal from city employment after exposing secretive salary hikes to the media. I was able to get a jury acquittal in less than 20 minutes and dismissal of a felony charge for a $16 city gas card purchase made within hours of his discharge. It was a standard reimbursement for his last week of services. At the same time, here in New York City, a man stole more than 50 billion dollars before he was finally arrested and charged with any crime. The relative aspects of public corruption on these two cases must be placed in perspective. The one here in this city involved not a mere $16, not a hundred dollars. It was not thousands, hundreds of thousands or even millions of dollars. It was not hundreds of millions or even the big “b” word. It was more than 50 billion dollars. How did this happen with all the commissions and regulatory agencies in existence when Bernie Madoff was guarding the chicken coop and running loose on the streets of Manhattan? Will the Bernie Madoff of the legal profession finally be held accountable after my presentation before this Commission? 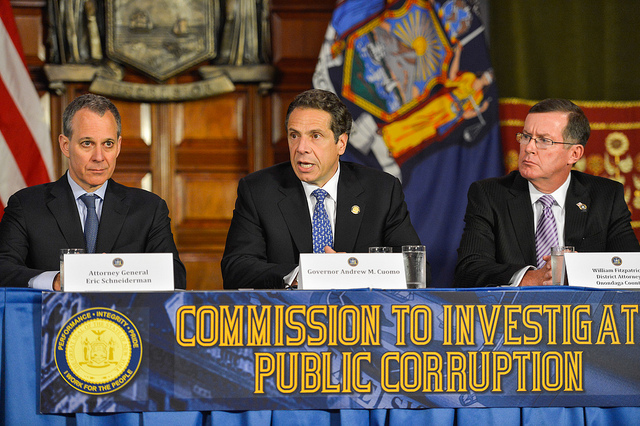 I appreciate this opportunity to share my concerns about public corruption in New York State.